Are you tired of building the same courses over and over again? Sure you may get to build a hundred courses, but they’re essentially the same course built a hundred times. The result is that many of the courses look the same and they don’t provide the opportunity to expand your course design skills. Today I’d like to offer a few tips on how you can get out of the hundred course rut. Most organizations probably won’t make time for you to “mess around with ideas” so you need to find ways to get the time. We often used the team meeting time to brainstorm ideas. For example, one challenge was how to navigate a course if all you could do was drag and drop objects and couldn’t click anywhere on the screen. Another was to come up with 100 analogies we could apply to our training programs: climbing stairs, climbing mountains, going down a road, entering a building’s lobby, etc. We then used some of the ideas as models for our course designs. The main point in the activity was to think about things in a different way and to prototype ideas. They may not always be used, but they will help develop your skills. As you know, I am a big fan of the weekly elearning challenges because they do exactly what I’m talking about above. They’re a springboard to playing with ideas. We present simple challenges to help nudge you a bit. They’re not intended to be big courses or even all that elaborate. Some people put together complete ideas and some just build quick prototypes. The main goal is to get you to try something different than what you normally do at work. Through that process you find new ideas and production techniques. Even if you don’t participate in the weekly challenges, I still encourage you to look at what’s being done. They’re a great source of inspiration. 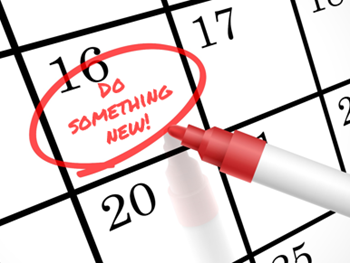 You may pick up some neat ideas that can be applied in your own elearning courses. All of the participants get the same instructions but the results are always different. It’s nice to see the diverse ideas. 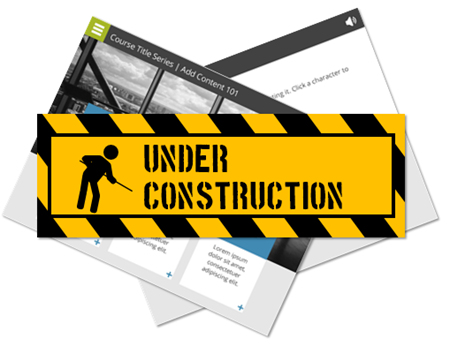 All of the Articulate community managers do a great job building courses. However, if I were to look at the demos they build without knowing who built them, odds are that I’d be able to match the course author to the course. And the reason is because we all tend to have our own style. That means our course screens tend to look similar. The layouts, colors, fonts, and object sizes all tend to be the same. That’s not a bad thing. But build the same type of course a hundred times exactly the same way can cause some creative fatigue. By stepping away from our own style and attempting to mimic the work of others we become better course designers. 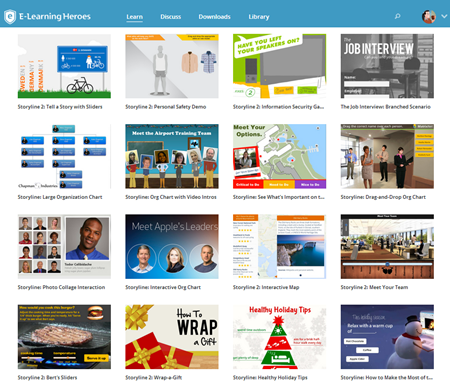 I recommend collecting elearning courses, multimedia examples, or visual design ideas that you find inspiring and then setting some time to practice recreating them. Step 1: Try to replicate what the content creator did. This helps you figure out what they did and how you’d do the same thing with your authoring tools. Don’t worry about copyright or anything like that. This isn’t for public consumption. Instead it’s for your personal development. Step 2: Once you have decent replication, start to iterate. Pretend that a client told you they wanted this project redone. What would you do? From there you’ll be able to transform the idea that inspired you to something that’s uniquely yours. And most likely it’ll look a lot different than what you would have done on your own. I usually look for color themes, font pairings, and visual design ideas like how shapes and lines are used. I’ll create a few different layouts based on the original design. E-Learning Examples: a good collection of all sorts of elearning and interactive multimedia examples that could inspire course design ideas. 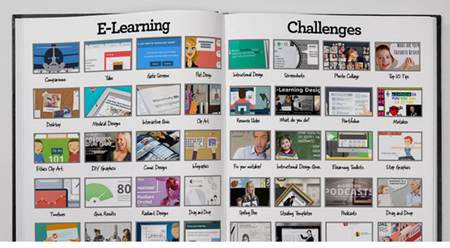 Articulate demos: the elearning challenges have produced over 1000 different examples. You can find a complete list here. But we also feature a few of the more popular ones and other demos in our examples section. News multimedia: with every major news event there’s usually some multimedia composed to explain it. USA Today and NY Times (links to examples) usually have some good demos. Museums: many of the large museums have interactive tours and demos. Here’s one from the Smithsonian on how to build a sod house and an interactive tour of the Louvre. Design sites: I’m not a graphic artist but I can glean ideas from those who are. I like to look at some of the portfolios on sites like Dribbble and Loviv. I often get ideas on layouts, colors, and UI. If you don’t want to get stuck building the same course over and over again, challenge yourself to find inspiration in the work of your peers. Make some time to connect with others and if you have time, join one of the weekly challenges. I’d love to see what you do. How do you find inspiration for your elearning projects? Share your thoughts by clicking on the comments link. Thanks for the additional examples. Can never have enough of those. How do I find inspiration? Visual inspiration is pretty much everywhere, if you’r looking: cereal boxes, TV shows my wife makes me watch, psychotropic Dr. Seuss’ books I read to my daughter before bed, and so on. My biggest challenge is finding the time, so kudos to the elearning manager that pays for people to experiment.